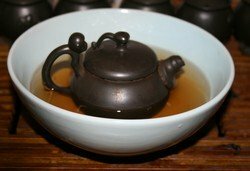 Important things to know about gongfu tea ceremony. Chinese tea ceremony is different from the Japanese. The emphasis is on practicality and not philosophy. It is merry and social rather than solemn. It is also easy to do and common sense. If the tea tastes good, all is well! The word "gongfu" usually refers to martial art, but its deeper meaning is "practice". A Yixing tea pot of an appropriate size, of course! For gongfu tea, they are very small and come in pairs: 2, 4, 6, 8, 12. For gongfu tea, you need something to hold the "sea of tea". Your Yixing tea pot is half-submerged in this "sea" during the gongfu tea ceremony. It can be a flat, walled plate or bowl or any container that can hold a few centimeters of tea and water. It will be nice to have a large rectangular Bamboo Tea Tray that holds any water that spills. I have one of this, it is attractive and easy to clean. Boil the water. Then pour the water over the pots and cups to clean them. This pre-heats the pot. It also makes the pottery easy to maintain, as you need not spend too much time cleaning them after use. The hot water will flow naturally outside the pot to the bowl to form the "sea of tea". Fill 1/3 to 2/3 of the inside of the pot with tea leaves. Do you like strong flavor? How long is your infusion time? If using a lot of leaves, you want to shorten your infusion time. Is the tea a high grade? If so you might want to use less leaves. Pour water into the pot with a BANG - so that the water goes in creating some movements with the leaves. Fill until the water overflows slightly with bubbles. Use lid to scrape away the bubbles. Then bath the tea pot by pouring hot water over the outside of the pot. This helps to season the pot. Again, the water will flow to the "sea of tea". For the first infusion, immediately pour out the tea from the pot to the "sea of tea". You are not trying to steep the leaves during the first infusion. The hot water "wake" the tea up, and remove any excessive "fire". Now you have the "sea" that steeps your pot from the outside! Repeat Step (3), but instead of pouring the hot water straightaway, you leave the water to steep. Steeping time will depend on your tea shop's brewing instruction, but will be in the 30 seconds to 2 minutes range. If not sure, steep for 1 minute, then increase for subsequent infusions. Use one hand to serve. Press lid with index finger and hold handle with thumb and middle-finger. Lift pot high to pour. Distribute the liquor in the pot to the set of (small) cups. The best tea sits at the bottom of the pot, as they are the densest. Therefore, to distribute tea evenly, serve in two stages. First fill each tea cup until they are half-full. Then move your arm clockwise continuously, so that the remaining tea dribbles to each cup in turn. Seasoning a tea pot is about forming a relationship with your Yixing. While the initial seasoning process may involve "cooking" your pot with hot water and soaking the pot with tea leaves, the process is ongoing. It may sound a bit rude, but caressing your tea pot can help smoothen the surface. Of course, always buy a pot that feels good to touch in the first place. Over time, it glows with a shine. Pour hot water over the pot. Wipe with a piece of soft cloth. When performing tea ceremony, pour hot water over the outside of the pot. When performing tea ceremony, pour tea liquor over the outside of the pot. After performing tea ceremony, massage the pot with used tea leaves. If you are brewing a tea to assess its quality, it is better to use a ceramic ware such as a gaiwan. This is because your Yixing contains "past memory" of other teas and is unlikely to give a fair assessment of the newly acquired tea. Yixing tea pot is highly recommended for brewing highly oxidized tea with strong body and weak aroma. But is can also be used to brew green tea and aromatic oolong. Where aroma is important, it is best to pick a Yixing of "high frequency". A good red clay pot (Hongni or Zhuni) is highly recommended. If you have several pots, pick one that gives a higher pitch when you knock the lid against the pot.